Elsie fundraising this year in Wetherspoons Ramsgate. Photo by Sarah Hewes. Elsie Miller (nee Kirkaldie) attended her last RNLI management meeting this week as Honorary Secretary having supported the station for more than 64 years. However, her family’s connections to the lifeboat go even further back into Ramsgate’s past. Her longest generational links with Ramsgate lifeboat starts with relative Stephen Penny who, in 1851, became second coxswain when the lifeboat Northumberland first arrived and went on to serve in the Ramsgate lifeboat for 55 years. In 1910 a relative of Stephen Penny, Douglas Kirkaldie, who was Elsie’s father, joined the lifeboat crew after impressing Coxswain William Cooper when being taken out on a service when the lifeboat was short crewed. Douglas was appointed coxswain in 1946 and on 20 August 1952, just four months before he was due to retire, took the lifeboat Prudential 18 miles off Ramsgate where the American Liberty ship SS Western Farmer had collided with the Norwegian tanker Bjorgholm. By the time the Prudential arrived the Western Farmer was beginning to break up and the Ramsgate and Dover lifeboats took off 25 crew members between them. As the lifeboats were leaving Douglas thought he saw something move on the deck of the American ship. He turned the lifeboat around and managed to pull another five survivors from the wreck in spite of the possibility that it could roll over onto the lifeboat at any moment. For this rescue Douglas was awarded the RNLI’s Bronze Medal. Elsie, on the left, attending her last meeting, passing on her knowledge to new Secretary Jean. Photo by Karen Cox. Elsie’s involvement with Ramsgate started at an extremely young age. She said: “When I was 6 months old Ramsgate Lifeboat took part in the Water Gala in Ramsgate Harbour. My father Douglas Kirkaldie was second coxswain at the time and one of the crew “Moggy” Catt dressed in one of my mother’s dresses and head scarf and carrying a doll the same size as me was “rescued” from a boat on fire. “When the lifeboat came alongside the Dover Steps he switched places with my mother, Rene Kirkaldie who was hiding under the engine room canopy. She emerged carrying me and the cheers changed to mutterings. “One of the audience shouted “You wicked woman, fancy putting that baby’s life in danger”. At this point Howard Knight, the Coxswain, said “Moggy get out here quick with that doll”. Moggy came from under the canopy with the doll and the audience realised there had been a switch. The cheers resumed and all ended well. “Because of my young age I wasn’t very aware of RNLI shouts etc, and in 1939 with the onset of World War Two the harbour was closed to the general public, so I didn’t know much of what went on. “I knew my father was one of the lifeboat crew but not much else. When Ramsgate Harbour became HMS FERVENT (a shore base with rooms and tunnels in the cliff beneath Wellington Crescent) my father was appointed coxswain of HM MB FERVENT and he had to stand down from the lifeboat for about two years. He then rejoined the crew and was appointed as bowman on the lifeboat. “In October 1945 the ‘Prudential’ was called out to the yacht ‘Lavender’ with three men on board, aground on the Goodwin Sands. It was a difficult rescue, and the report states that all three men were landed safely. “What it doesn’t say is that one of the survivors died in the night, and I came down to breakfast to find my father with tears running down his face. He explained about the rescue and how dangerous the Goodwin Sands are. “My next rude awakening was 1946, when I was ten years old. The Mumbles lifeboat was lost with all hands, and seeing the pictures and report of the upturned lifeboat in the papers I said “but lifeboats don’t sink, lifeboat men don’t die”, and my father said “sometimes my dear they do”. This made an everlasting impression on me, and the work of the RNLI meant a lot more. “In September 1954 the Ramsgate Ladies Lifeboat Guild was formed and my mother, a founder member, enrolled me. Because I was working full time I wasn’t able to do much but I did help when possible. “I married in 1956 and my children were born 1957 and 1960. In 1962 the Ladies Guild needed a new Honorary Secretary and I carried on until 1971 when my full-time work made it difficult. I continued to help in the background where possible. “During my time with the Ladies Guild I introduced souvenirs and the sales of these grew over the years. Our first kiosk was opposite the ladies toilet in the Pier Yard. We also had a lot of help from the Queens Head on Harbour Parade, who sold souvenirs for us all year round. Souvenirs went from strength to strength and we eventually had a caravan in the Pier Yard. “In September 1985 I was asked to become Chairman of the Ladies Guild but had to stand down in 1986 when we (the family) had to move to Ashford. I was invited to join Ramsgate Station Committee in 1985 and was able to continue with this as the meetings were in the evenings. 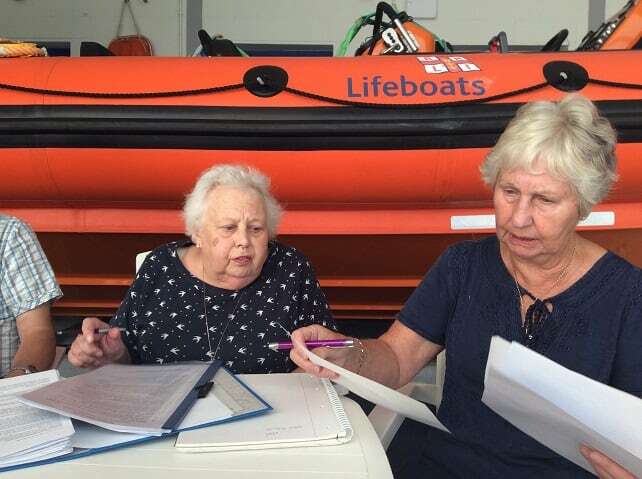 In her usual modest way Elsie doesn’t mention that her commitment to Ramsgate RNLI meant that her husband John has driven her from Ashford every time there was a committee meeting since 1986, and she has attended numerous fundraising events. She has also been presented with the RNLI Silver Badge in 2003 and the RNLI Gold badge in 2014. 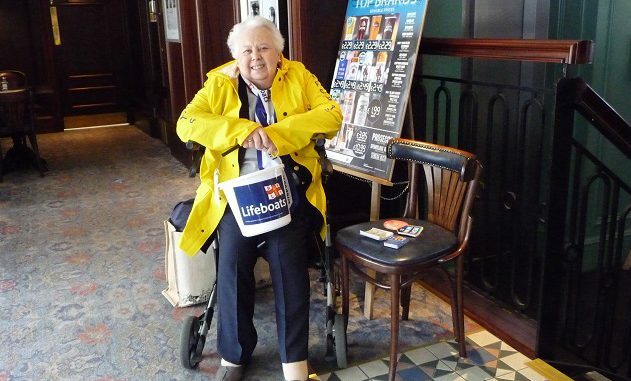 The RNLI is a charity that relies entirely on public donations and without the support of dedicated people like Elsie it would be unable to continue with its role of saving lives at sea. She and her family are a brilliant example of how dedication to service can make a massive difference to people’s lives and the whole station wishes her a long and healthy retirement. Report by Karen Cox with thanks to John Ray for use extracts from his book, The History of Ramsgate RNLI Station.